Easy Sloppy Joes are the best dinner recipe. Ground beef, onion and bell pepper simmer in a flavorful sloppy joe sauce that your entire family will love! Easy homemade Sloppy Joes are the ultimate, easy, family comfort. 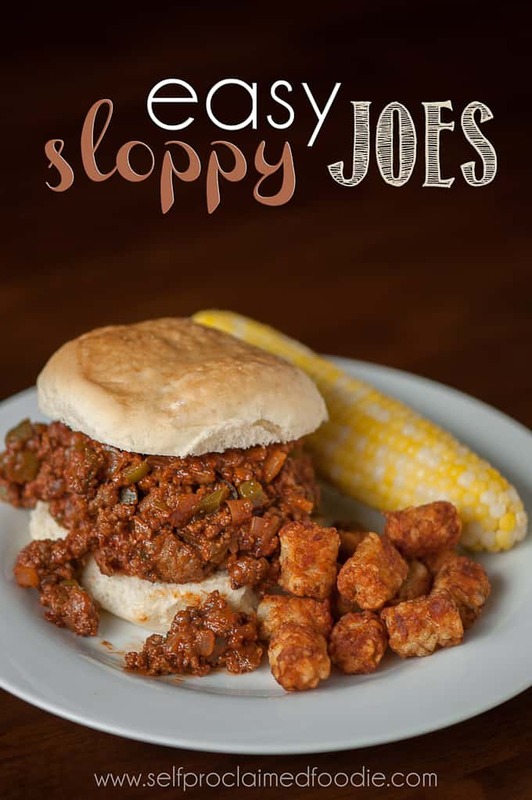 We make these sloppy joes A LOT in our foodie household. Most days I try to make really healthy dinners where half the plate is green veggies, a quarter of the plate is a healthy starch, and the other quarter is a lean protein. I like to eat clean. No, seriously, I do. But there are those days where I require comfort food. When we were kids, the version of sloppy joes we ate consisted of ground beef with a can of Manwich. Do you remember that stuff? Gross. It’s remarkable I’m still alive and am a reasonably healthy person considering all the garbage we ate growing up. Things like canned sloppy joe sauce were easy and no one saw anything wrong with it. Any child of the 80s and 90s can relate. Wanna know what’s in a can of Manwich? My friend, google, told me: Tomato Puree (Water, Tomato Paste), High Fructose Corn Syrup, Distilled Vinegar, Corn Syrup, Less than 2% of: Salt, Sugar, Chili Pepper, Dehydrated Green and Red Bell Peppers, Tomato Fiber, Guar Gum, Spices, Xanthan Gum, Dehydrated Garlic, Natural Flavors, Citric Acid. Don’t feed that garbage to your family. 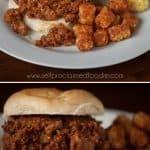 Homemade sloppy joes are so easy to make, taste a million times better than canned “sloppy joe sauce”, and you’ll feel really good after stuffing your face with them. I promise. What is Homemade Sloppy Joe sauce made of? This homemade sloppy joe sauce recipe is made of ingredients that are so much better for you than what’s in the can of manwich! Since the main part of this sauce is having meat in it, you will most definitely need ground beef. To add all the delicious flavor to that meat, you will need a yellow onion, green bell pepper, tomato sauce with no salt added, ketchup, tomato paste, yellow mustard, Worcestershire sauce, chili powder, kosher salt, sugar, dried oregano, and black pepper. Together, all of these delicious ingredients will create the best sloppy joe recipe you will ever have! 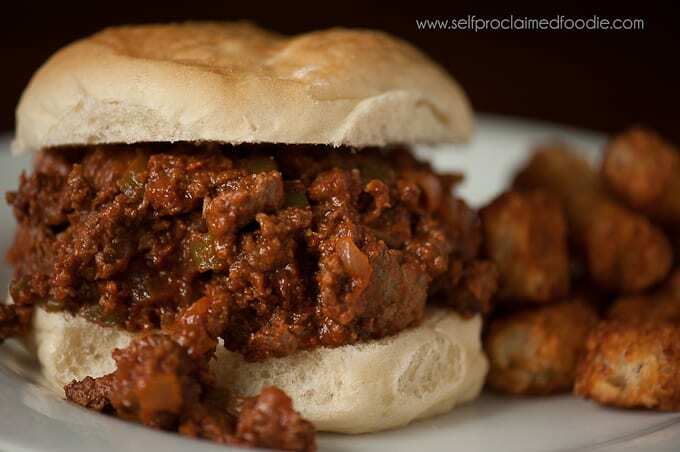 How do you make easy sloppy joes? The best sloppy joes are made homemade. So, to start, you will need to cook your onions, pepper, and ground beef in a skillet until the meat is slightly browned and crumbly. While the meat is cooking, you will whisk together tomato sauce, ketchup, tomato paste, mustard, Worcestershire sauce, chili powder, salt, sugar, oregano, and pepper. Next, you will stir your mixture in with your meat and continue to cook it but on a lower heat. You should let them simmer all together for about ten minutes to make sure that the flavors are all blended. 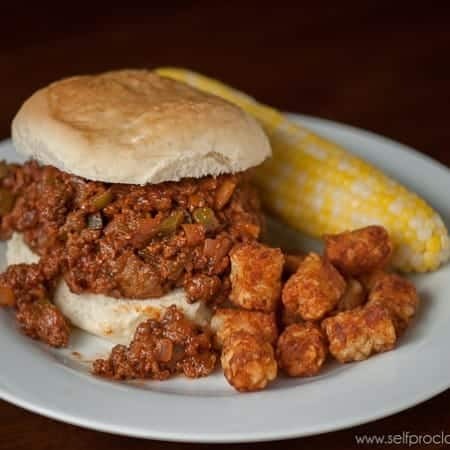 All that is left to do is to scoop your delicious sloppy joes onto your buns and serve them up with a side like tater tots and corn on the cob! 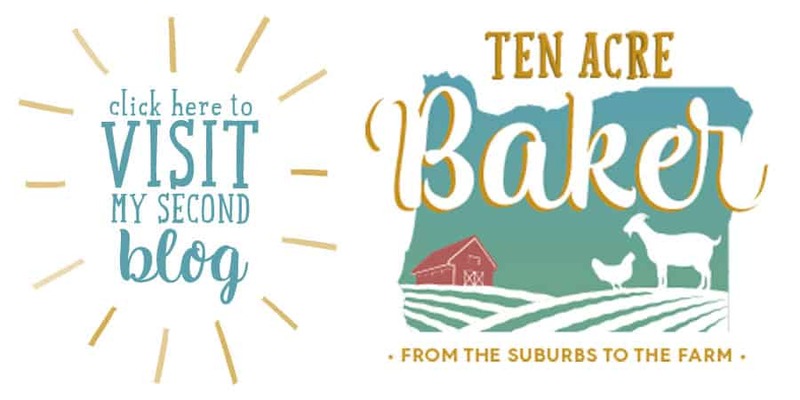 Love easy ground beef dinner recipes? Load your buns up with these Easy Sloppy Joes. Ground beef, onion and bell pepper simmer in a flavorful sauce creating the ultimate family comfort food. In a large skillet over medium high heat, cook onions, pepper, and ground beef until meat is slightly browned and crumbly, about 15 minutes. Meanwhile, in a medium sized bowl, whisk together tomato sauce, ketchup, tomato paste, mustard, Worcestershire sauce, chili powder, salt, sugar, oregano, and pepper. Stir mixture into skillet with meat, onion, and bell pepper and stir to combine. Reduce heat to low and allow to simmer for a minimum of 10 minutes to allow flavors to blend. Spoon hot sloppy joe mixture onto buns and serve.